Sometimes we may need to send the files to our friends without being uploading the files to server. Because that files may contains some important details or you don’t want to share that file information with anyone. Of course, we can compress and password protect the file and send to another user but you don’t want to take risk on it. We can simple upload our files to file sharing sites and we can share that, but those files are accessible to file sharing company and you don’t want to share those important files with anyone except the receiver. So here is 4 best ways to share your files without uploading to any server and you can send files directly to the recipient. All the services what we have listed here are totally free to use. Most the these services supports large file transfers too. 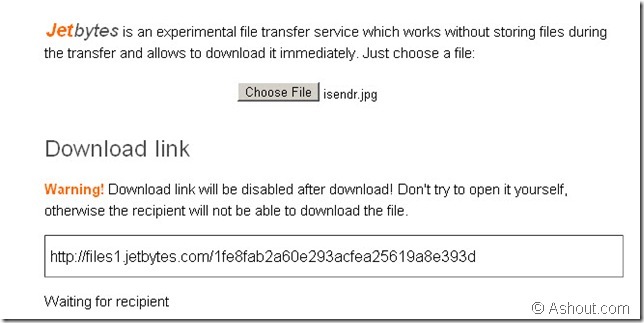 isendr is a new company which can help you to send files directly to the recipient. With this service we can password protect the files what we are sending to add an extra layer of protection. To send and receive files both the sender and recipient must be online because the files is going directly to the receiver without being uploading to the server. No registration required to start using this service and it’s still in beta. Files Over Miles works similar to isendr, and here also we can password protect the download file easily. This files over miles sends the files direct to other users (P2P) using your browser. To start using just select the file and after selecting the file it will provide a unique URL and share that URL with your friend who you want to send. No registration required and it’s in Beta stage. Pipebytes also similar service as said above two services. We can instantly send music, movies, presentations or any other files to anybody directly. No software to install. All you need is web browser. No hassle registrations, and don’t even require your e-mail address! Send files of any size! Your buddy could start downloading file as you upload it. It’s private unlike BitTorrent or other P2P technologies. The file is not shared on Internet – it is sent directly to your recipient. Free Widget for your web pages. To use jetbytes just choose the file you want to send and share the download link provided by jetbytes with your friend or whom you want to send that file. That’s it. Download link will be automatically disabled after download! All the service needs both the user and recipient must be online, otherwise it cannot be possible to send the files directly without uploading. If you know any other services other than these, you can share those here in comments. I personally use FilesDIRECT to send large files and store them online: you can send 2GB files even with the free plan, storage starts at 2GB, there’s no software to install AND it includes 128-bit SSL encryption on all transfers. And unlike most similar services, this one’s been around for nearly a decade. The problems with all you have listed are: 1. you can send only one file at a time. and 2. the moment you or the receiver closes the browser, or connection is interrupted, you have to start all over again. I have something unique to present in this topic. Though, all of the mentioned services claim not uploading files on the server it is not really correct. These services uses there own server for relaing files over it. So, the files are piped over these servers. The only one true sevice in inet who do direct transmission peer-to-peer is click2copy. It uses special algorithm to traverse through your NAT / firewall. Try it. It is the most interesting service in this category.